London Marathon eh, what a day! And the celebrities were out in force. I miss the days when the Cheeky Girls entered running races but this year’s crop of slebs were all pretty serious runners (thank God for Ian of off Eastenders). Some cracking times in here. And I’m including a few top athletes with TV presenters etc because why the devil not? My own review of the race will be up later this week. It was a double win for the Kenyans with Wanjiru crossing the line as first male and fellow Kenyan Mary Keitany first female. He told the BBC the frontrunners had been holding world-record pace for around half of the race but then the sun came out and it became too hard to keep it up. I think the sun may be why I didn’t win. Wow Mary! I met and ran with this awesome woman on Friday morning at Adidas Runners. 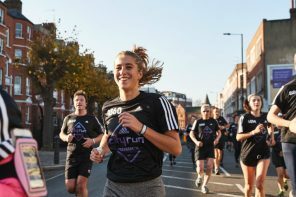 Seems that last-minute training with the crew helped her out as she broke Paula Radcliffe’s women’s-only marathon record of 2.17:42, which has stood since 2005. Had hoped just by touching her on Friday some of her greatness would rub off, apparently she stole all my running power instead, oh well, if it helped her win. Beng an ex-Olympian is cheating right? They’re all so stupidly fast. Last year the former rower was a DNF after a hip injury kicked in half way round. This year he powered through for an amazing time. Apparently Sir Seb Coe asked him how long it took and then bowed. Nice. Chrissie bloody Wellington She’s just so good at everything. She only went and won her age group in the non-elite race (F40-44) and ran the marathon nearly 10 minutes faster than she did back in 2002 when she crossed the line in 3:02. And she looked so happy doing it as well. Machine. Note the bare feet, should have packed flip flops for after Chrissie, they’re invaluable. Rowers are fit aren’t they? The duo who won the women’s pairs in 2012 and 2016 started the races on Sunday, then they ran it too. Wonder if they’ll display their medals with their Olympic golds? This was the Radio 1 DJ’s first marathon and before she started training she wasn’t even really a runner. She banked a stonking 3:36:21. Nice one. Yes Sophie! Ducking under 3.30 nicely there and a PB to boot. 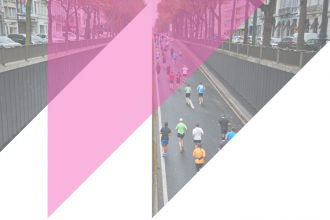 The newsreader is a keen runner and looking to complete the Abbott World Marathon Majors Series this year . She’s already got Tokyo, New York, Boston and Berlin under her belt so just Chicago to go. She’s back! Time was Jenni was running every race but then she went off and had kids and we didn’t see her for a while. Now she’s back and putting in some good running for marathon number six. The Siddiqui’s are my all-time fave Googlebox family so pleased to see the lovely Baasit running his second London marathon, taking nearly 15 minutes off last year’s time. A London marathon regular, Chris finished his third 26.2er just a couple of minutes slower than last year’s 4:39:51. The ex Made in Chelsea star is back again, bit slower than last year when she finished in 4:10:27 but she said she had a tough one. Random fact but for the 2016 marathon she was being trained by Hunter off of Gladiators. Here she is casually leaning against a phone box and selling some beauty products. He’s a TV presenter that you kind of recognise but you’re not really sure where from. Maybe it was Celebrity Dinner Date eh? Ian from the chippy in Eastenders was running with his 18 year old son Sam. They were raising funds for The Air Ambulance Service as Sam was taken to hospital by an air ambulance last year after being hit by a car. He had to learn to walk again, so completing the marathon in 4:24:20 is a pretty awesome feat. It took his dad a little bit longer but then he did have an ice cream with his mates on the way round. Here they are on the bus on the way there, looks like fun. Think I want to run with Ian/Adam next year. Lovely Jo Pavey was aiming for World Championship Qualification, which would mean have meant finishing in 2:36 or under. 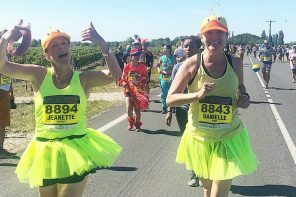 It was her first marathon for six years but unfortunately it wasn’t meant to be. Her hamstring kept cramping from around 13 miles so she made the tough but sensible decision to drop out. Luckily she’s vowed to keep on running. We like Jo lots. Feeling inspired? 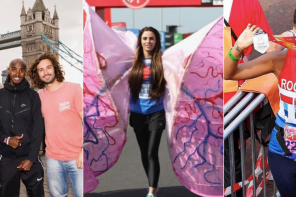 The ballot for the 2018 Virgin London Marathon opens on Monday 1 May and closes on Friday 5 May. Get your name down here.